What will the next revolution look like? “INTERIOR’ A THREE STORY INDUSTRIAL DESIGN HOUSE DATING FROM THE BEGINNING OF THE 20TH CENTURY, EMPTY SINCE 1989, IN DISREPAIR (VIRTUALLY UNHEATED) WITH TECHNICAL EQUIPMENT, BRICK WALLS, PEELING PAINT, LARGE COLUMNS, THREE FLOOR OF HEIGHT WITH DIAGONAL STAIRWAY. DARK FLOOR, DAMP WITH PARCHED GREY AND BLACK STAINS. 6PM AMBIENT LIGHT FROM EXTERIOR, EMERGENCY LIGHT SOURCES INSIDE. A BULB HANGS FROM THE CEILING ABOVE A LECTERN ...”. A 35-minute performance consisting of narration, texts, slides and video from The Museum of Non Participation. This performance uses a meta-narrative to chart the coming into being of The Museum of Non Participation, a social and political experiment to define the boundaries of non participation and resistance. 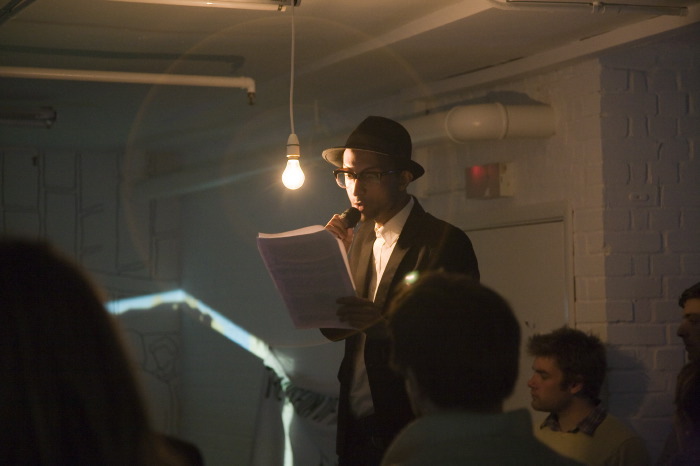 Performed by Karen Mirza and Nabil Ahmed. The performance is part of All that remains... the Teenagers of Socialism which runs at Waterside Project Space from 12 March to 25 April 2010. Waterside Project Space is supported by the National Lottery through Arts Council England. We gratefully acknowledge the support of Mr James Ellery and Wonder. We would like to thank the artists, Nabil Ahmed, Jools Voce, Maxa Zoller, Mike Sperlinger, Talkeoke, Wajid Yaseem and Joel Cahen. Documentation: Gerda Leopold, David Spraggs, Pierre d'Alancaisez.